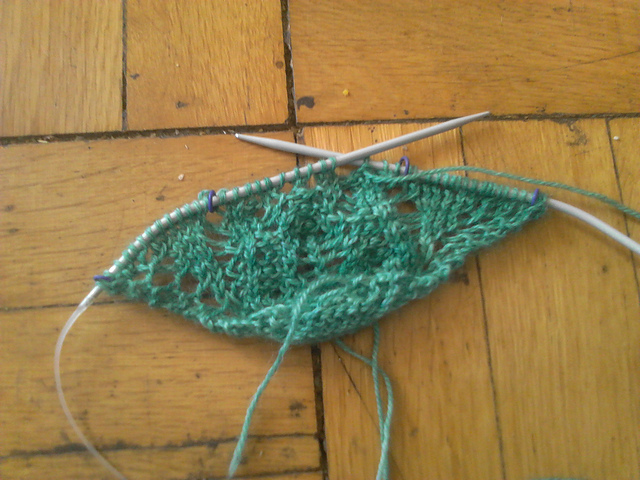 Sarah Dawn's Designs: Shawl Progress! So while I haven't done a lot on the Raglan Lace Sweater, (given that I've had to frog back a good part of it and thus lost my interest in it for a bit), the Flower and Leaf Shawl is coming along reasonably well. Sadly, the picture does not do it justice, since the lace opens up a lot better when it's blocked. Short rows with lace mean that I've got to keep track of lace motifs that happen on different rows at the same time, and I'll be honest and say I'm not sure how on earth I could chart this (right now I'm treating it as a written pattern only, and if I figure out how to do the charts, I'll add them in). But it's coming together ok, with the use of copious amounts of stitch markers. It is, however, a pattern where all the wrong-side rows are purled, so at least there's some respite there. That being said, it's been quite an interesting challenge to put together, and I'm really enjoying it. I don't think I'll finish it before the June 30th deadline, but I intend to keep working on it afterwards.